Villa, 4 Bedrooms, 6 Baths, (Sleeps 1-8). Rate based on 2 sharing nightly. Voted amongst the top twenty villas in the Caribbean by Conde Nast Traveler in 2007, Ohana Villa stands apart as one of the most striking places to stay in Tobago and the Caribbean and was designed by one of the Caribbean's foremost architects. Ohana is a Hawaiian word for family rest-house and the owners’ intention for the house was that the architecture and interior design would successfully entangle the guests in an organic and spiritual way. The result is that Ohana is indeed ‘a very special place’, a perfect haven of peace and quiet to escape to, with family and friends from the hustle and bustle of city life. The sheer scale of the property provides just the right amount of privacy with luxury, style and barefoot elegance. This, along with the warm and sincere welcome of our staff ensure that as soon as you arrive, you’ll find the stresses of the city slip away as easily as your shoes at the front door. 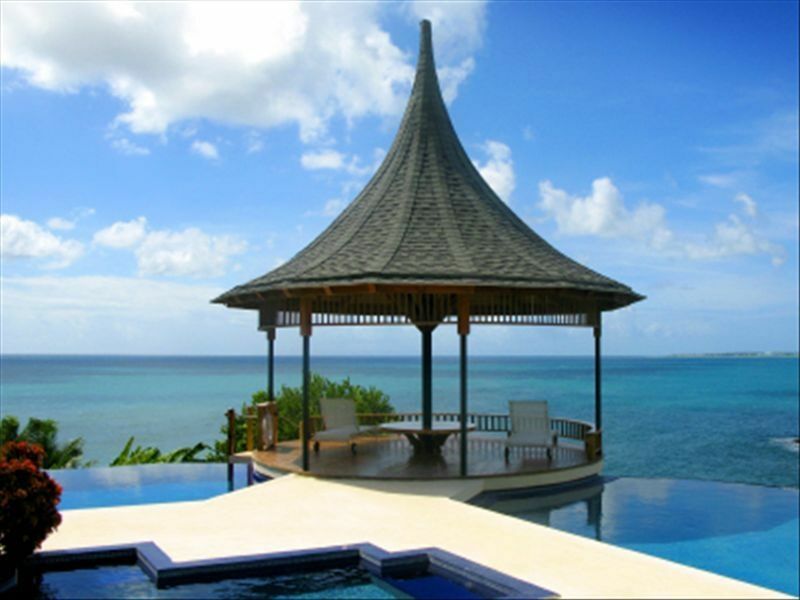 Located on the south east corner of Tobago in Bacolet, Ohana enjoys 180 degree views of the Atlantic Ocean. The house is orientated with the prevailing trade winds to keep the house cool. The garden is full of tropical and exotic flowers and fruit, and runs down to a small sandy protected cove, protected by a reef just out in the bay. Ohana was designed with a Balinese tropical influence and resembles a small village of tiny houses perched upon a bluff. Four double bedrooms wrap around a large sun deck of two swimming pools, jacuzzi and a large koi fish pond. Each individually designed bedroom is lavishly furnished with a four poster bed, en-suite bathroom and air conditioning with overhead fans and digital bedroom safes large enough to hold your laptop. Humming birds, blue birds and cocricos fly around the gardens, and you can watch the ornamental koi fish from your hammock whilst sipping a home made rum cocktail. Sample our excellent local or European cooking, or try a fusion of both from our renowned cook, one of the best on the island. So hard is it to leave Ohana, that even though the stunningly beautiful little island of Tobago is full of enticing activities and day trips, our guests find it difficult to tear themselves away from the house. In fact, many guests never leave the house and wonder why they hired a car. Worth leaving home for are Tobago’s beautiful waterfalls; one of the oldest rainforests in the northern hemisphere; and for bird enthusiasts, there are over 210 different bird species; as well there are excellent diving and deep sea fishing. Our staff will be happy to arrange for any island activities using our preferred tour operators. 1 house manager and 2 housekeepers look after the running of the house and will do as much or as little shopping and cooking as you require. Most guests prefer to do their own grocery shopping, however for those of you that don’t, we will be happy to do it for an additional fee, saving you those extra hours for topping up that tan! The way that cooking works at Ohana is that all ingredients for lunch and dinner are paid for by guests, and there is a cooking fee of US $10 per adult, US $5 kids. Excellent and highly recommended aromatherapy massages by our massage therapist can be arranged for $50 USD. Ohana is indeed a very special place, a place that refreshes the mind, as well as the body. The kitchen is fully equipped with a double-door stainless steel fridge with filtered water and ice making facility, plus another large fridge for keeping drinks cool. There is also a large stainless steel gas cooker – and of course a dishwasher. To one side is an open-air barbecue area and on the other a pantry and a utility room with large washing and drying machines. The vast living room is open to the bay, allowing ocean breezes to work their relaxing charms, but simply wind down the cream canvas shutters to provide restful shade for a snooze on the over-sized teak day beds, filled with plump cushions and bolsters. Close by four teak armchairs also recline fully to allow you to relax completely. The house is stocked with board games, DVDs and a selection of CDs for times when the view alone is not enough. We had a fantastic stay at Ohana Villa and already thinking about when we might return. We loved our entire experience visiting Tobago. A very special house. I've been communicating with guests for many years now. The moment Kat got in contact, I knew she would be a great guest. Can't wait to have her family back again! O'hana Villa is as tranquil, relaxing and picturesque as Tobago gets. Almost hidden away in the hills of Bacolet (an area not commonly visited by the average tourist to Tobago), O'hana is impressive, from the very entrance of the property. Inspired by Balinese architecture, there are shutters instead of windows, in the almost fully wooden structure. The property has 4 grand en suite bedrooms, stylishly designed, and each one unique. But the most stunning part of the property is the pool and jacuzzi outdoor area, with koi pond and gazebo. Literally every inch of this villa is beautiful and picture worthy. And what makes this the perfect peaceful getaway, in addition to all that, is that the villa comes with daily tasty meals at your request, all prepared with pleasure by villa Manager, Rena. She has excellent customer service and a sweet hand in the kitchen. I promise you will never want to leave the villa. Leave Pigeon Point, Store Bay and Mt. Irvine for some other trip to Tobago.....because once you set foot in O'hana, it will be love at first sight. Thank you for taking the time to write a review of your stay with us. I hope you can make it back soon! Every visit I make to Ohana increases my admiration for the amazing wooden structure that I call a creation. It is a welcome change from today’s steel and glass designs which can be beautiful, but are simply incomparable to Ohana. I remain in awe with the details that went into the building of this villa, it’s absolutely mind blowing. On entering Ohana I am immediately transported to an idyllic environment of tranquility, serenity, and total relaxation. A well earned tonic for the mind and body. In addition, Rena, the manager prepares some delicious culinary dishes to complement the overall scenic view. There is really no need to leave the compound. So I don’t. A true holiday with a difference which I recommend 100%. You will have no regrets. The more I venture out fro Ohana, I am reminded of how beautiful an island Tobago is. So happy to share our home with you and your family! We recently stayed at Ohana Villa for 2 weeks. The villa and views are gorgeous. We spent hours and hours each day sitting in the shaded gazebo or on the daybeds in the open living room, and enjoyed the beautiful views. The small private beach just below the villa was also very nice. However, the villa had some problems that the owner should get fixed. The toilets flushed intermittently (had to pull it just so to flush). The house phone was not working for 5 days. The fish pond is so dirty with algae that you can't even see the fish. The pool lights were not working. The floor boards are worn and scratched - they were not refinished as the owner said they would be prior to our visit. Many of the pool tiles are missing of faded. The dishwasher doesn't clean well. The outdoor grill fell into an abyss. The knives were all so dull that it was hard to cook anything that required any cutting. The stove has inadequate heat (takes forever to boil a pot of water). The security guard comes into your private space in the evening unannounced. All of these issues have diminished our ability to fully enjoy this otherwise nice property. Thanks for your review of Ohana. Some of our recent reviews are commenting on the overall experience of Ohana and not the detail. I hope you and others see from my response that we work through feedback like this to strive for perfection. Our toilets were found in a basement of a Victorian hotel in Port of Spain. It takes a certain knack to make them work. They are checked quarterly by our plumber. TSTT the local phone company has installed overhead lines throughout Tobago. When it rains, everyone gets water in the lines and it takes quite a while to get fixed. Our pond is now clear after fixing a blocked line for the pump. You visited in dry season when the water temperature is high and algae forms quickly. Our wooden floors were not worked on before your visit due to us being booked with guests. The next time we have a week spare we will be attacking the floors. The pool will be due a re-look with our big annual maintenance period this October. The dishwasher. Unbelievable that it's impossible to buy rinse detergent tablets/liquid in Tobago at certain times of the year. We prepared a concoction of vinegar, bicarbonate soda and fairy liquid that you did not use. The outdoor grill has returned from the abyss...a new one was made and installed. You only had to ask Rena if you wanted the knives sharpened more and she would have done this gladly for you. Our kitchen has overhead fans...they diminish the burner strength when you cook. A design fault of Ohana. I often remark at the differing temperatures of ovens when I travel. Our security guards try their best to not encroach on guests for their privacy. We have to check the house is secure and I am sorry if this made you uncomfortable. Hope you can visit us again one day. Always a pleasure to welcome you...hoping that you can make it back a third time next year! The view from the deck area is amazing and the staff were very helpful. Sunsets were gorgeous. However, the villa was in need of serious repair. One of the pools was green all week because they ran out of chemicals. The kitchen appliances were old, rusty and the refrigerator did not keep cool. The pots and pans were all broken and not many utensils. The dishwasher did not clean and we usually had to run two cycles. The bathroom faucets dripped constantly and the showers drained slowly. The oven ran out of propane and we were forced to go purchase dinner out after we had already purchased dinner to cook at a local grocery store. The floors definitely needed refinishing. Definitely will not return. Thank you for taking the time to write this review and for giving us your feedback on your recent visit. Firstly, please accept my apologies for the jacuzzi being green during your stay. We had a new pool man start up recently and his reaction to what happened was completely unsatisfactory. There were chemicals on site, and the problem was due to a blocked impeller on the pump causing a filtration issue. We took way too long to fix this, due to him not communicating the problem to his boss for the repair. The salty blasts from the Ocean, the terrific humidity, does affect metal, wooden and fabric elements around the house. We have lost track of how many water heaters, pumps, cookers, fridges, microwaves, TV’s, lighting fixtures, etc etc that we are continually having to replace. I’ve just purchased a new selection of pots, pans and utensils. The rusty appliance you noticed was our trusty coffee machine which has now been replaced. A top of the line fridge was delivered last week…we have 2 in our kitchen. The reason we have 2 is because if the fridge is opened constantly for drinks, the temperature can rise. So we use one for food and the other for drinks. Our dishwasher was purchased only a few months ago. Tobago is a small island, impossible to buy rinse aid or dishwasher salt locally. We are now trying out kosher salt with vinegar to try and keep our dishwasher working well. We did notice that you were putting pots and pans in the dishwasher, and not rinsing the plates before loading the machine. This is a big subject of debate in my house, some people do this, others do not. My wife and I have huge discussions about this! I would suggest rinsing all plates before loading the dishwasher due to the problems we have sourcing rinse aid and dishwasher salt. After you left, we had our quarterly plumbing service to the house. Our faucets only drip when not turned to the right ‘off’ position. We will now add this to our house tour for all future guests. Our oven did run out of propane…and we had the backup tank turned on within one hour of you calling us. Our living room floors will be sanded and varnished over the next month. I hope the details mentioned above show that we are reacting to your comments. Our efforts are forever ongoing in regards to this special and lovable house that is Ohana… and we sincerely hope that you may be able to forgive us… and even perhaps, return one day to give us all at Ohana another try. Rates are based on 1-4 guests staying except for Christmas and New Year (1-8) Cleaning charge included.